Now, when Protein World created billboards on the London underground encouraing people to essentially starve themselves to be 'beach body ready', I got the outcry. When Pepsi released that advert with Kendal Jenner, I got the outcry. When Cancer Research released the above advert, I... didn't get the outcry. 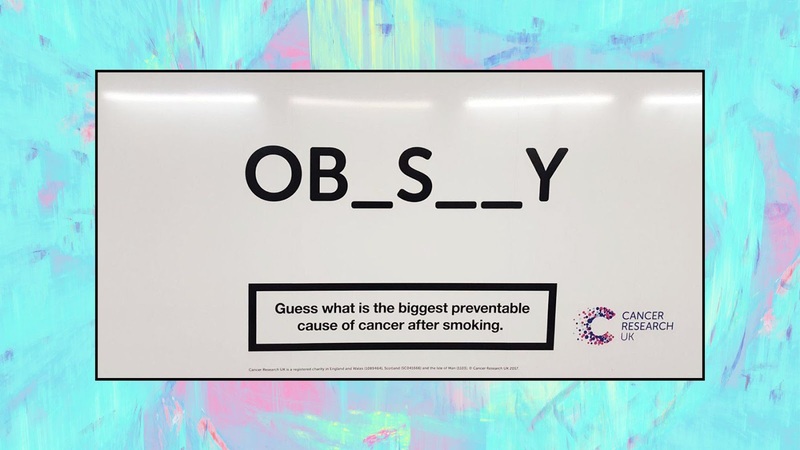 Don't get me wrong, I am all for seeing both sides of the argument, however this advert came to the forefront after a Twitter user slammed Cancer Research, telling them she would not be donating to them again as they were 'fat shaming' her with the advert. People were split completely down the middle. You had people very much in favour of what the user had said, and some who were very much not in favour of what the user had said. "You're fat shaming" , "BMI isn't a thing" , "I lead a healthy lifestyle I'm just bigger" and "You're scaremongering" were all comments I saw, and the same comments continued over on news outlets who had picked up on the outcry. Cancer Research however, were still standing fast in their research, stating that there was copious evidence that obesity was the new smoking in terms of damage to your help. They have calculated that 60 cases of cancer a day could be avoided if people stopped reaching for the McDonalds from their car windows and instead made healthier choices. 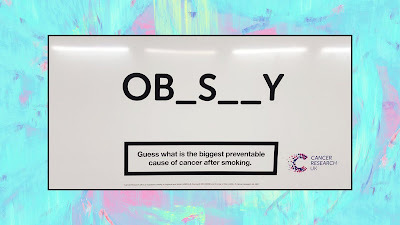 Cancer Research UK chief executive Mr.Kumar said that "Obesity is potentially the new smoking, if we're not careful", which is a comment he made after years of research by the charity. If you pick up a packet of cigarettes and see the picture of lung cancer on the pack ; is this smoker shaming? If you are warned away from sunbeds due to harmful radiation ; is this tanning shaming? Cancer Research, and unbiased charity which is paving way for helping find the cures and triggers for cancer, are raising awareness of the common causes for cancer. Sure, you may not like it, but there is, and always has been, copious research from various countries and various institutes about the detrimental impact that being obese has on your body. Excess pressure on your heart, lungs and other vital organs means that you are statistically more at risk of premature death than that of someone of average weight within the UK. This is the same for smoking ; you're more likely to get lung cancer if you smoke than those who don't smoke. That's a fact. It's a hard hitting fact ; but it's a fact. Ever seen a PSA from Ireland about driving whilst drunk or driving and texting? Yeah, if you haven't, I recommend you do. If anything, it'll shock you in to thinking twice before picking up that phone to Snapchat your Spotify playlist for your 40 friends. In my opinion, Cancer Research are doing what they have always done - providing the facts in such a way that make you sit up and take note, and boy have people taken note.